No. 1 Church Street has particularly attractive patterned brickwork on its 18th century facade, using vitrified red brick, probably made locally, with red brick dressings and banding. 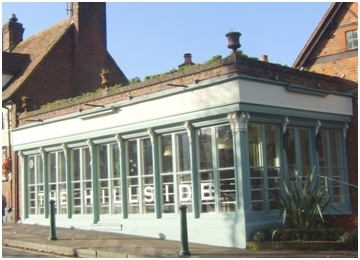 It is now the entrance to the restaurant that occupies the conservatory-style building on the corner. This was rebuilt here in 1931, having been rescued by the owner, Charlie Collins, from the winter garden of Blackmore End House, a local mansion that was being demolished. From 1931 to 2006 the whole building was occupied by Collins Antiques. Charlie's son, Samuel ("Sam") Collins MBE, was a lifetime resident of the village and an important figure in the parish. He was greatly interested in village life, its people and its buildings and was a parish councillor for 39 years. Sam and Charlie are both buried in the churchyard, just across the road from the restaurant..